How would you like some Apples? Well, at least how would you like to make some apple ornaments for your favourite Teacher, or Apple lover? 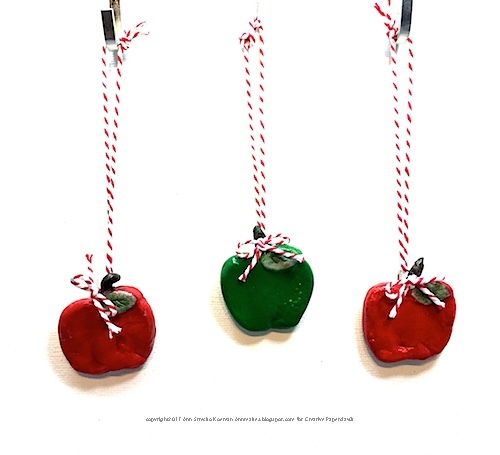 Hi, today over at the Creative® Paperclay Blog I am sharing how I made some easy and cute apples to be used as hanging ornaments or just gifts. They are easy and quick to make, and can be done with a group of children. Adults will enjoy making these as well. The process is fairly simple and I share several step by step pictures over at the Creative Paperclay® blog. All you need to do is dust the inside of the plastic mould with some talc powder to make it easier to pop out the dried clay. Push some clay into the mould, let it sit a few minutes than pop out the apple shape. While the clay is drying but still moist, insert a paperclip halfway into the back of each apple. Let the apples dry. Smooth off any rough parts with an emery board or some fine sandpaper, brush off any dust, and paint. I chose to add a final coat of Sealer to give the apples some shine and protection, but that is optional. Finally I tied some small bows and glued those to the tops of each apple and strung some more twine through each paper clip. I hope that you are inspired to go play with some Creative Paperclay®. Thanks for stopping by.